Liberty Skis, a boutique brand of award winning all mountain skis, blasted onto the scene at their official Australian launch party held at Fix8 Art Gallery on Saturday 29th May. 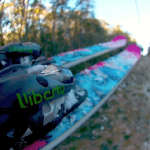 Liberty Skis bring to Australia their focus on rider driven innovation and commitment to minimising their environmental impact. Known for their strong, light and responsive bamboo core, Liberty displayed their full range of men’s and woman’s skis, colourful and inviting graphics suspended across the pristine white walls, it was alpine hardware art. The unique ski designs were perfectly complimented with a selection of other artwork, including powerful, clean, strong lined drawings by well known artist, Caspian, as well as a range of beautiful Australian alpine photography by Andrew Fawcett. There was an eager crowd on hand for the Liberty information session early, curious to see the award winning skis that have finally arrived in Australia for the first time. 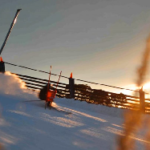 The former CEO of Perisher Blue and current CEO of the Australian Ski Area Association (ASAA), along with top tier retailers, were notable attendees going through the full range of award winning skis. 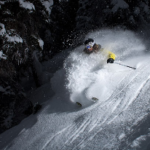 During the launch, the godfather and pioneer of Australian free skiing, Andrea Berchtold, was officially knighted into the Liberty Skis pro team. There were many other well know Australian free skiers enjoying the festivities and countless bamboo shots, including; Chris Booth, Boen Ferguson, Charlie Timmins, Andreas Gloor, Oddy Graham and recent Olympian mogulist, Ramone Cooper. The party was fuelled all night long by an endless supply of Smirnoff Mules flowing from bamboo stems thanks to the kind people at Diageo. It was smiles all around as the Liberty Skis Team put on a premium, boutique party in line with their premium, boutique brand of award winning all mountain skis.